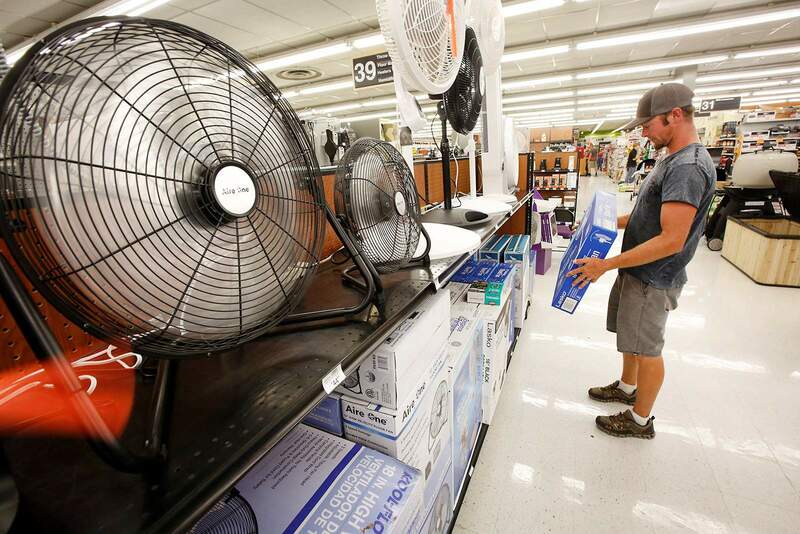 Cody Hager of Hesperus shops for a fan at Kroegers Ace Hardware as temperatures climb into the mid-90s in Southwest Colorado. Hotter-than-average summer temperatures have fueled business for those selling relief in the form of air conditioners and fans. During much of June, residents were unable to open their windows because of smoke from the 416 Fire and that sparked “super high demand” for new air-conditioning systems, said Sonny Balbez, owner of Altitude Heating and Air Conditioning, a Durango-based company. He has been selling many ductless, mini-split air conditioners, which are seen in hotels and motels and can be installed in existing homes. The air conditioners range in price from $3,500 to $5,200 depending on the size of the house, he said. “The equipment is really expensive, but they work great,” he said. Those seeking cheaper relief may have turned to fans. Kroegers Ace Hardware didn’t see a marked increase in demand for fans compared with past summers, said Jordon Turner-O’Keefe, a floor manager. However, box fans remain popular among customers because they are inexpensive and easily fit into windows, he said. Highs in June and July were regularly 5 to 10 degrees above average, said Mike Charnick, a meteorologist with the National Weather Service. June 27 marked the hottest day of June at 95 degrees, he said. The normal high in June in Durango is 81 degrees. The drought is partially responsible for the heat. When the ground is dry, temperatures near the surface can heat up more than normal, he said. Higher-than-average temperatures have persisted despite the arrival of afternoon monsoon rains, he said. “It’s not quite as warm as it has been, but it is still above average,” he said. Daily highs are likely to come closer to the seasonal average by the end of the summer, he said.